Sacrifice shapes which lead to the under the stones tesuji. Though very rare compared to other shapes, but it exists. An example is Under The Stones Problem 8. Black can connect even if white captures the 3 stones. DrStraw: Better for B to play back into the center of the 3 stones than to fill an outside liberty. The effect on B'S shape is the same, but W is not as good. unkx80: Making a more general statement, I believe the sacrifice stones may be the following shapes, with the optional addition of stones in the x direction or beyond. Bill: The only (non-nakade) example I know of is in the corner, where it is not a question of an eye, but of points. Black picks up 0.5 point. OC, if we are going to include shapes where the question is points, there is no end. E. g., bent seventeen. 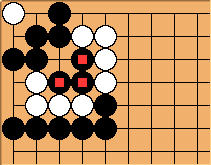 This is a 2/3 point Black sente (unless White is komaster, when it is worth 1 2/3 points). ... was when I made the mistake of playing here, thinking it was a snapback . Bill: I think this is an example of the stupid four ( ). It's the sacrificial shape, not the capturing shape, that is in question. OC, since a nakade can be under the stones, any nakade shape might qualify. <shrug> But we don't usually think of making that shape as tesuji.